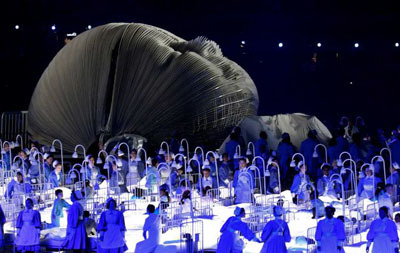 The Opening Ceremony of the 2012 London Olympics was too long, too strange and too occult. These are the main criticisms I have heard. The three hour extravaganza that played out before a crowd of 80,000 on July 17 was indeed long and strange. By the time it reached the power blast of fireworks and emotion at the end, the $40 million production seemed more like a Woodstock, with a rock and love feast spirit winning out over the traditional pomp and circumstance. 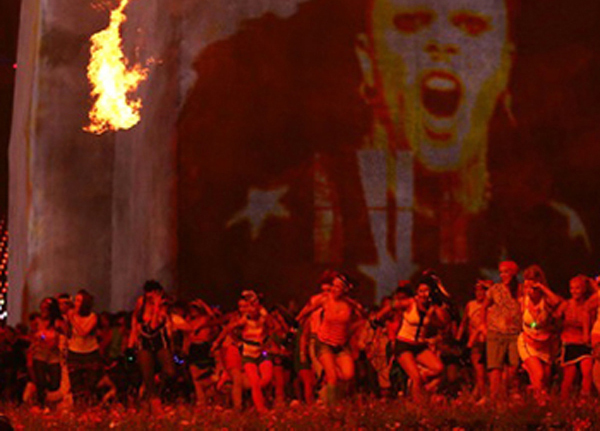 British producer Danny Boyle, who composed the show, proved himself a master of agiprop - a new term derived from agitation and propaganda that conceives stage plays with ideological messages. As for the agitation, in fact, it was very agitated and chaotic with the 10,000 volunteer workers always rushing about pulling apart or rebuilding scenarios on the field. This frenzied tone was magnified by the pulsating rock music and dizzying flashes of screen images in the stadium. The new generation is accustomed to that pace, but 40 years ago it would have disgruntled any audience. As for the propaganda, I believe there was an occult message behind the strange three-act “history” of Britain that Boyle presented. This was something many sensed - even secular papers have printed pieces asking if the Olympics opener had a hidden meaning. Other bloggers exulted that the ceremony heralded a shift in consciousness of mankind, the entrance of a New Age of oneness with the Earth, universal fraternity and world peace. Here is my interpretation in an attempt to make some sense of what seemed at times an almost nonsensical show. Act One began with an Avalon-like countryside scenario, complete with sheep, cows, thatched roof houses and maypoles. 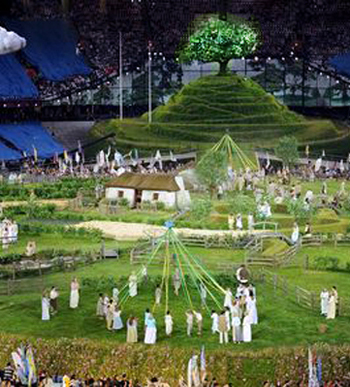 At one end of the stadium, a tree reigned atop a mount, whose form recalled the shape of the Babel Tower. I would say the tree represents the tree of knowledge, which gives to those who taste its fruits an imaginary Gnosis, explaining all the secrets of nature and religion. In fact, reportedly Boyle intended to replicate Glastonbury Tor, with mythical roots to the Island of Avalon, a site that still today attracts pagan and occult ceremonies. It is an idyllic picture of nature, a paradise for mankind where God is not present. It is a world without original sin, where man is in tune with nature. The soundtracks reinforced the utopic ideal: The first song was a song titled Jerusalem sung by a young boy before he was joined by a children’s choir. The second was titledNimrod, recalling that old King Nimrod, the Babylon despot who united all nations and tried to build the Tower of Babel, a first attempt at a universal republic without God. Act Two shows how that bucolic paradise was broken by the greed of capitalists who produced the Industrial Revolution. Suddenly, with a thunderous burst of percussion led by Evelyn Glennie, the deaf drummer who looked like a Shakespearian witch hammering a ritual drum, the scene changed. The grass was rolled away; the tree was literally uprooted; the villagers vanished. Smokestacks burst out of the ground; sooty laborers marched out of the hole where the tree had stood; the smoldering hell of the 18th century Industrial Revolution emerged. The ant-like workers then began to slave away to forge a great circle of metal – which would later be raised aloft as one of the five molten Olympic rings. This act was billed as a tribute to the Industrial Revolution, which made England great and wealthy. I believe the real message is quite different, actually the opposite. It is an appeal to destroy the effects of Capitalism and bring back that lost paradise. Only this would explain the whole atmosphere of darkness and horror rather than of well-being and prosperity. The belching smokestacks and pounding music tied in with this message, not that of an honorable homage. Overseeing the work was a group of “businessmen” with bushy sideburns, top hats and three-piece suits. They were the evil capitalists, controlling everything and prospering on the labor of others, oppressing the people and nature. Along the sidelines a punk-circus atmosphere reigned, adding to the noise and chaos. The only actual homage was paid to suffragettes and other groups who had suffered “discrimination” from that oppressive system: A Marxist-like critique of inequality, structural injustice, and the man who wants everything for himself. Act Three reportedly was to honor British children’s literature and the National Health Care system. It was the darkest, strangest and most unnerving of the three acts. Hospital beds were rolled out and unruly children began to jump on the mattresses all the while being scolded by traditional English nannies. Suddenly the nightmare began. 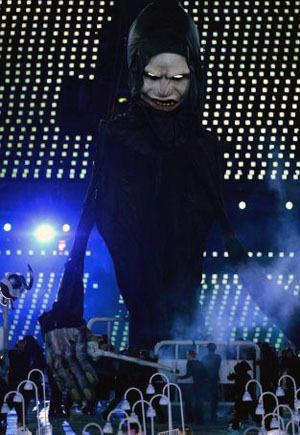 A 100 foot Lord Voldemort with flaming eyes appeared and loomed large over the beds, accompanied by a sinister Captain Hook (from Peter Pan) and Cruella de Vil (101 Dalmatians). With them came small black demons that chased the frightened children. In my opinion this also was not a homage to hospitals, but an allusion to the bourgeois entertainment industry symbolized by the Disney “bad guys” who distract children with its glitz and glamour from seeing the evils caused by the capitalist system. The demons and villains of that bad system – which allegedly have caused poverty, injustices, discrimination, inequalities and oppressions of every kind - now appear, exposed in all their horror. Those sick children need a different treatment to be rid of the evils of the old system and wake up to the new order that is rising. The old traditional nannies were ineffective, and new care-takers are also needed to heal the children. The terror is heightened by the music, a piece associated with the occult, Tubular Bells by Mike Oldfield, made famous by the motion picture The Exorcist. It confirms my impression that the scene represents a hidden message of awakening to “exorcize” the devils that keep people sick and anesthetized. It is a black magic that can only be overcome by a good white magic. From the air comes a team of Mary Poppins, the magical governess to chase away the monsters and restore order in the dormitory. They are the antidote to the Disney devils, the “good agents” meant to guide the world to a different consciousness. Under these good Mary Poppins, the children become docile. 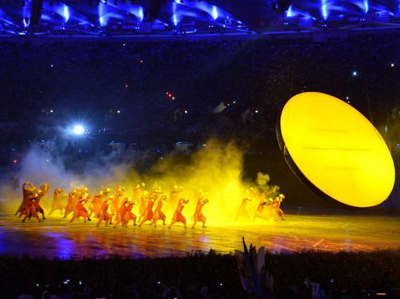 Then their attention is drawn to the center of the stadium, where a humongous fetus appears. It is something a-borning – but what? All stare at it with an almost religious attentiveness and awe. The scene shifts, and we have the brief appearance of Tim Berners-Lee, the English scientist who invented the World Wide Web, tapping out a message to the world: “This is for everyone.” The web is one of the English contributions to the new order that is rising, the new babe that is coming to light but still tied down by the gazes of the present day system. This coming new order is not so different from the final “synthesis” dreamed of by Marx as the necessary development of Communism. It is an ecological new era that takes advantage also of some technological improvements made under Capitalism, such as the world wide web, which created conditions for globalization: a means of global communications and an immense commercial and financial network. Thus it stimulated relations among all the peoples, continents and nations, creating pre-conditions for globalization. “It is for everyone,” as its English creator tapped out at the ceremony. It is the sexual revolution glorified, the hippie revolution that revolted against all morals and discipline - the “old taboos - which provides the soundtrack for the ushering in of a new age that rejects the discipline, order, pomp and ceremony of the past. 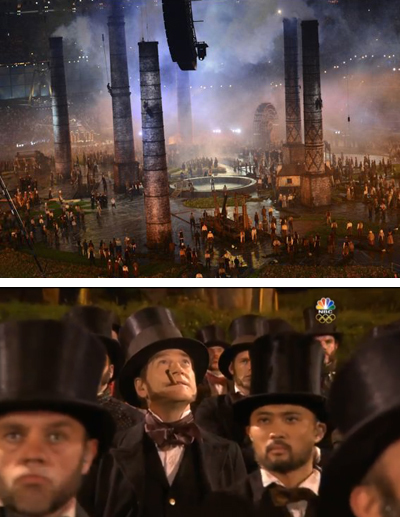 Another strong metaphor was saved until almost the end, when the Olympic flame was ignited. More than 200 flaming copper stems rose from the ground until they joined aloft to form a giant crucible of fire in the center of the arena. 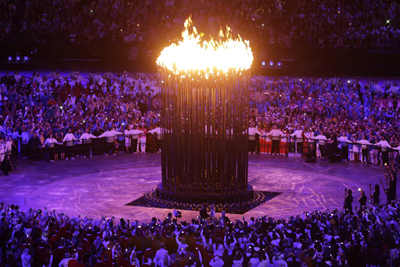 The athletes gathered around it in a circle, reverently, “adoring” the fire representing universal fraternity of man. This is what I offer to TIA readers as my take on that strange ceremony.